The gang of five youths had terrorized a bus in Sydney carrying Jewish school children, some as young as 6 years old. They made signs slitting their throats while chanting “Kill the Jews” and praising Hitler. The local Jewish community welcomed the punishment, saying that education was a better method of combating anti-Semitism than a fine or a period of incarceration. Local social workers and police also welcomed the creative form of punishment. The offender has agreed to express remorse for his actions. Tufts became the latest American university to witness swastikas and anti-Semitic graffiti painted on the side of dorm rooms. Police were called to the campus on Saturday morning to investigate the fresh painting of swastikas. They said they are taking the matter very seriously. Man Haron Monis, the gunman shot dead by Australian Special Forces early on Tuesday morning after taking hostages in a Sydney café, was (among other things) known for a string of anti-Semitic attacks. Monis, who claimed he was a Muslim Sheikh, had for years sent anti-Semitic letters and emails to Australian Jews. In 2011 he was prosecuted for a letter he sent to the parents of an Australian Jewish soldier killed in Afghanistan, who Monis described as a “dirty animal” and “a thousand times worse than a pig”. He likened the Jewish soldier to Hitler. At the time he begun his siege yesterday, Monis was on bail for being an accessory to the murder of his former wife as well as for more than 40 sexual and indecent assault charges. Britain’s Observer newspaper (which is the Sunday sister paper of the Guardian, with which it shares a website) has been criticized for choosing to use a photo of George W. Bush standing in front of a Jewish menorah – one of the few times Bush has stood next to a Jewish symbol (it was a photo from a Hannukah party in 2008) – to illustrate its official editorial last Sunday, titled “The Observer view on torture”. The editorial discussed the report issued last week in America by the Senate Intelligence Committee into the CIA’s interrogation of terror suspects following the 9/11 attacks. Given the rise of anti-Semitic discourse in the UK, Jewish and other groups are urging editors at respectable newspapers not to do anything to encourage conspiracy theories. Conspiracy theorists suggest Israel and/or Jews were both behind the 9/11 attacks and behind the Bush and Obama administrations’ response to them. Critics says that even if the use of the menorah photo was subconscious, and not in any way intentionally anti-Semitic, they should be more aware of allowing any subconscious prejudices to creep through. Among other recent examples of this, the (London) Sunday Times used a picture of Hassidic Jew to illustrate the dangers of the Ebola virus being transported into America. (Question) Chuck Todd: What creates more terrorists, torture or drones? (Answer) Richard Engel: The history of terrorism is complicated - it goes back to US support for Israel. Richard Engel has won multiple awards – including for his highly critical reporting on Israel. In 2012 he was kidnapped, tortured and released by a militia in Syria aligned to the Assad regime. The co-founder and former foreign minister of Hamas, Mahmoud al-Zahar, admitted in an interview with Al-Aqsa TV on Sunday that then Palestinian Authority President (and Nobel peace prize winner) Yasser Arafat transferred arms and explosives to Hamas to carry out terror attacks against Israelis at the start of the intifada in 2000. Hamas, together with Fatah’s al-Aqsa brigades, carried out a wave of suicide and other attacks that killed and injured thousands of Israeli civilians, following the collapse of the Camp David Peace Talks when Arafat turned down Ehud Barak’s and Bill Clinton’s offer of an independent Palestinian state. Al-Zahar said that Arafat (who received billions of dollars in funding from western countries) transferred the weapons through a third group that Arafat set up for the purpose, called the Omar Al-Mukhtar Forces. 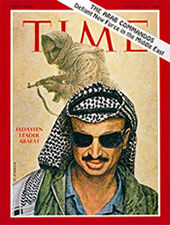 Israel has long alleged that the second Intifada was not spontaneous but was carefully planned by Arafat, though most Western media have failed to report this. During a mass military parade on Sunday, Hamas flew a drone over Gaza in a show of strength. The Israeli air force scrambled warplanes to monitor the Hamas drone, which did not cross into Israeli airspace. On the ground, thousands of masked Hamas militants paraded through the streets showing off their latest weaponry, including M75 rockets which have a range of 80 kilometers (50 miles), and can reach Jerusalem and Tel Aviv. In its charter, Hamas calls for the eventual destruction of Israel and the establishment of an Islamic state on the pre-1948 borders of the British Palestine Mandate. During the conflict this summer, Israel shot down two Hamas drones, which entered Israeli airspace. The drones are believed to have been manufactured in Gaza. The BBC’s Australia correspondent Jon Donnison is again being assailed by media watchdog groups for taking time off from covering events in Australia in order to send an inaccurate and defamatory tweet about Israel. He has long been criticized for sending out misleading tweets. For example, in 2012 he sent out a tweet which he said showed a Gazan child injured by an alleged Israeli attack, which was in fact a photo from the Syrian civil war. Donnison’s latest tweet wrongly alleging Israeli misconduct during an incident in the West Bank, in fact originated in a fake report carried by the Russian propaganda station Russia Today. The New York Times is to be credited for admitting (on December 14) that its sensational front page story and another follow-up story last month about a supposed arson attack by settlers on a West Bank mosque (in the village of Mughayer) was wrong, and that the small fire in the mosque (which caused limited damage and injured no one) was in fact caused by an electrical fault. The Associated Press (on December 15) and the Israeli paper Haaretz has also now acknowledged that it was wrong to blame Israelis for the fire. The supposed arson attack generated a worldwide wave of intense media criticism of Israel last month. Most other media are yet to offer corrections. Below, I attach a new essay by Daniel Kurtzer, the former American ambassador to both Egypt and to Israel. The essay, published in the American Interest magazine, is being widely discussed by the Israeli left. Kurtzer argues that the Obama administration should disregard the lull created by the Israeli election campaign and formally lay down its vision of a future deal between Israel and the Palestinians. One point Kurtzer does not address in his essay is that in past instances where the U.S. has tried to impose a deal on the Palestinians, this has resulted in extreme violence against Israeli civilians, most notably after the failed 2000 Camp David talks, and in a more limited way in the last year since John Kerry tried to push President Abbas into compromising with Israel. Before that I attach a piece by the Israeli journalist, Ben Dror Yemini (who is also a subscriber to this list). A subscriber to this list who works in cooperation with the U.S. government on security matters, writes in relation to item 5 (“Did Iran help North Korea in Sony Pictures attack?”) in my previous dispatch. It’s a neat way of having it both ways. The Guardian published a letter in response to my article of December 1, from Baroness Jenny Tongue, a well-known critic of Israel who has on a number of occasions been criticized for allowing her views to spill over into outright anti-Semitism. After reading the article by Tom Gross (A modest proposal: let Gaza host the World Cup, 1 December), I had to check my diary to make sure it was not 1 April. The article is such nonsense that a considered response is not needed, but I would like to ask Mr Gross if he has been to Gaza recently, and if so whether he could point out where exactly Ismail Haniyeh lands his private jet. I think we should be told. Never one to let facts get in the way of her attempts to score cheap political points, Jenny Tonge can’t even be bothered to do a cursory Google search before shooting off letters to The Guardian. If she had, she would have seen that Hamas PM Ismail Hanieyh has himself texted journalists boasting about his trips on private jets, as the New York Times and others have reported. Op-ed: As the Israeli-Arab conflict becomes more religious, solidarity with the Israeli side grows; because now the war is not against Israel – it’s against the entire Western world. These words, said by children aged six to 13, were broadcast during a solidarity ceremony with the Islamic State, in which participants also waved the organization’s flags. It didn’t happen in Mosul. The ceremony took place recently in one of the suburbs of Sydney. The shocking event was documented by the Australian 7News television news service. The irony of date is that the Sydney café where the hostage siege took place Monday is located beside to the network’s offices. The children participating in the ceremony are wearing Muslim clothes, speaking English. They are guided by adult jihadists. The education they receive is similar to the education in Gaza. It’s happening on the other side of the world. The goal is not to free al-Aqsa. The goal is to free Sydney from the chains of democracy. It turns out that there is no need for the Palestinian-Israeli conflict, or for the occupation, to nurture hatred towards democracy and the West. The jihadists in Sydney are also calling for the death of US President Barack Obama and Syrian President Bashar Assad. “It’s sickening,” Australian Immigration Minister Scott Morrison said in response to the video. The Australians are also trying to do something. The immigration policy is changing. The Israeli infiltration prevention bill is an embodiment of humanity compared to what is going on there. What has Australia done to them? Why prepare a cadre of children, starting from the age of six, educate them to jihad and raise them as potential shahidim (martyrs)? Australia hasn’t done anything to them. They don’t need someone to do something to them. That’s because the global jihad organizations, from 1915 to this very day, from al-Shabaab to the Taliban, from Hamas to Islamic State, from Boko Haram to al-Qaeda, share the same ideology: Imposing Islam’s rule on the entire world. Islamic State leader Abu Bakr al-Baghdadi said several weeks that the plan is to take over Rome. Why Rome? Yunis al-Astal, a Palestinian Parliament member on behalf of Hamas, explained even before the IS declaration that Rome must be conquered because it is “the capital of the Catholics, or the Crusaders.” All stops lead to Rome, including Sydney. Most Muslims, including in Australia, are not jihad supporters. The problem, as always, is with the radical minority, which is trying to impose a nightmare. The problem is that the minority acts. Thousands of Westerners are joining ISIS. Not a single Muslim has come out of the West to join the battle against IS. The Israeli-Arab conflict, or Israeli-Palestinian conflict, is becoming more religious. This change has another aspect. The West is very biased against Israel when it comes to the national conflict, the settlements, the occupation. The overdone support for a nonexistent Palestinian state is proof of that. But on the other hand, as the conflict becomes more religious, there is much more solidarity with the Israeli side. Because then, the war is not against Israel. The war is against Sydney and Rome. It’s true that the delusional margins in the left will continue to understand jihad, offer explanations for it and blame Israel. But the majority in the West is beginning to show signs of repulsion. It is running out of patience. But when we went back to talk about Israel, he returned to the old slogans. What is happening in Australia won’t wake the free world from its slumber. But another small alarm bell rang Monday. Let’s just hope that the wake-up call won’t arrive with a festival of bells. The Middle East peace process is in a deep hole, with no easy way out. The Israeli coalition, none too interested in pursuing engagement on peace, is now frozen in place with elections scheduled for March 17. The Palestine Liberation Organization and the Palestinian Authority are weak, don’t govern in Gaza, and barely represent a majority of Palestinian opinion. The PLO seems intent on pursuing a UN statehood option that is guaranteed to elicit a U.S. veto. The United States, the traditional third party and catalyst for negotiations, is absorbed with other crises at home and abroad, and is apparently not interested in investing more effort in the peace process sinkhole. And the context for a negotiated peace is anything but conducive: the Middle East is broken, at war with itself, and in the midst of historic transformations in identity, state power, and religious ideology. Under these circumstances, it could be argued that the best course of action would be to do nothing: in other words, to wait until the situation is more propitious or “ripe” for peacemaking and for a time when leaders are better prepared to take the necessary risks to reach an agreement. But this is an attractive option only for the opponents of peace. On the Palestinian side, Hamas derives support and legitimation from peace process setbacks, for this bolsters its argument for resistance. The absence of a peace process does not force Hamas to confront its rejectionist, absolutist stance on Israel, enshrined in its Charter. On the Israeli side, settlements leaders and activists take heart from the breakdown of peace efforts, for it provides time to build more settlements and gives meaning to the argument that Israel does not have a partner with whom to make peace. Doing nothing also really does not mean doing nothing. Life goes on in the meantime, and the bad behaviors of both Palestinians and Israelis (terrorism, incitement, settlements, onerous occupation practices) continue during a period of inactivity in peace making. At bottom, the argument for doing nothing rests on the false premise that the status quo can hold until the situation allows for progress toward peace. Reality is different: status quos in the Israeli-Palestinian arena are never static, and they inevitably deteriorate when positive actions are not taken to improve them. The alternative to a strategy of doing nothing is often thought to be a “Plan B”—that is, a different strategy than the one that has been followed until now, namely pursuit of the two-state solution. Currently, the market is awash with Plan B’s, with many rushing in to fill the perceived vacuum. For example, former Israeli Ambassador to the United States Michael Oren believes the time has come to return to unilateralism, a theme taken up by others with variations. Former military intelligence chief Amos Yadlin wants Israel to unilaterally determine its borders. Naftali Bennett, the leader of Israel’s National Home Party, advocates the annexation of Area C—more than 50 percent of the West Bank—while easing up on the rest of the area by providing Palestinians with autonomy. Former settlements leader Dani Dayan argues for “peaceful non-reconciliation,” eschewing annexation while maintaining Israeli control under more relaxed conditions. Other Plan B’s offer different solutions. Israeli Foreign Minister Avigdor Lieberman urges Israel to make peace in a regional context, from which a Palestinian state would emerge, and in which there would be territorial and population swaps, along with economic incentives for Israel’s Arab citizens to emigrate. Al Quds University President and former negotiator Sari Nusseibeh has argued for Palestinians to forego independent statehood as a goal and to accept full social and economic rights within Israel, but without citizenship. There is a movement among Palestinians to accept a one-state solution, as long as Palestinians are given full citizenship and voting rights. Some Palestinians have argued that Palestinians should aim for confederation with or absorption into Jordan, rather than pursuing their own independent state. And there are jointly developed, creative ideas such as “two states in one space,” a proposal developed by IPCRI in consultation with Israelis and Palestinians. Thus far, none of the Plan B’s has gotten much traction, and they are likely to take their place on the library shelf alongside the scores of other plans that have been advocated over the decades. All of these plans share at least one thing in common: They seek to avoid the only common sense outcome of the Arab-Israeli conflict that has been known ever since it was first surfaced in the 1930s by the British Peel Commission: namely, partitioning the land between the two national movements that claim exclusive control over all the territory. If there really is no acceptable Plan B—and I submit that to be the case, that there is no alternative to a two-state outcome that would be acceptable to a significant majority of Israelis and Palestinians—then what should happen now, when the prospects of achieving Plan A, two states, appears so remote? Israelis and Palestinians need to confront this question on their own; for the United States, the policy implications are clear. No progress towards substantive negotiations between Israelis and Palestinians is possible now. Neither side can move because of politics, weakness, and/or ideological rigidity. An attempt by the United States to revive negotiations now is ill-advised and certain to fail, leading to further weakening of U.S. credibility. The status quo is neither static nor sustainable, and is likely to deteriorate if nothing is done. Plan B strategies won’t work and will only serve to detract attention from the obvious, though hard, decisions that ultimately need to be made to reach a two-state solution. First, the United States should articulate U.S. positions on the core issues—that is, American parameters. (See, for example, here). Forty-seven years after the 1967 war, it is time for the United States to express its views on a peace settlement. The parameters would represent American views of the principles that would drive negotiations, once the parties are ready to negotiate the details. The parameters would represent American policy, and would not be represented as reflecting the positions of the parties. Indeed, the United States would not seek formal responses from the parties. The parameters would represent American policy. Second, if the United States opposes bad behaviors, it should act accordingly and not simply issue statements of condemnation. U.S. statements that criticize Palestinian violence and incitement, or Israeli settlement activity or occupation practices, have become meaningless, because they are only words. If we truly oppose these behaviors, we need to exact consequences from the party that acts irresponsibly. Without U.S. action, U.S. credibility suffers. Any U.S. actions in response to bad behaviors will be politically difficult and controversial, especially U.S. actions directed at Israel. For this reason alone, the responses must be measured and of a kind that is able to be seen as reasonable by the publics in the region and at home. U.S. security and humanitarian assistance should be fenced off and not become part of this policy of exacting consequences for bad behaviors. Third, the United States and others need to develop a strategy and take steps to start deconstructing the occupation. The Palestinian economy, trade, and labor are all dependent on Israel, and Israel uses the West Bank as a closed market for Israeli goods. A game plan is needed to build independent Palestinian capacities. These changes will need to be introduced gradually and carefully so as to avoid short-term dislocations especially in Palestinian society. Fourth, the United States should consult closely with Arab states to develop ways to activate the Arab Peace Initiative, to the extent possible. The Arab Peace Initiative is very important, but its benefits for Israel kick in only at the end of the peace process. If the United States starts to act more forthrightly as advocated here, so too should the Arab states do more than simply reiterate support for their initiative. As the United States takes the steps above, which the Arabs are likely to welcome, the Arabs should also be taking steps to signal Israel about the tangible benefits of peace—for example, regional working groups on pressing issues such as health and water, diplomatic contacts, and the like. The political fallout in Washington and the region from this integrated U.S. strategy is likely to be severe. Republicans in Congress will seize upon these policies as evidence of bias against Israel and seek to lay claim to being Israel’s only friends in Washington. Right-wing members of the large pro-Israel community in the United States will protest the administration’s actions. The current Israeli government will balk and, at a minimum, accuse the United States of unveiling these ideas so as to interfere in Israel’s elections. Some Palestinians will argue that the U.S. policies do not go far enough. However, the impact of such pushback, both here and in the region, should not be exaggerated. The essence of this strategy is to articulate U.S. policy, to make clear what we support and do not support. Two immediate questions arise: how does this strategy relate to the Palestinian strategy of forcing a UN Security Council vote on statehood; and should the United States launch this strategy in the midst of an Israeli election campaign? On the first issue, strong and determined leadership by the United States will make any Palestinian UN initiative look weak in comparison. The Palestinians might not back off, but a U.S. veto in this context will be far more reasonable and explainable than a veto in the absence of a U.S. strategy. Regarding Israeli elections, the United States is a factor whether we articulate a strategy or remain silent. Indeed, U.S. silence at this stage will be represented by some in Israel as acceptance of the status quo. To be sure, the announcement of a U.S. strategy now will be far more controversial than waiting until later. However, having an American strategy on the table will also help inform the debate in Israel over the critical issues involved in peace making. On balance, it is far wiser to be upfront about our policy—if we decide to go in this direction—than to unveil it only after the Israelis go to the polls. The risk/benefit calculation of this strategy clearly weighs in favor of implementing it. Since there is no expectation that it will lead to negotiations, in a sense it can fail only if the United States abandons it in the face of opposition from the region or domestically. Potentially, it could stimulate a healthy debate in Israel and Palestine about issues that are normally avoided. And, at a minimum, it will leave U.S. policy in far better shape to craft a strategy in the future to reach negotiations, once the politics in Israel and Palestine will allow it.